11th Asia Cup cricket tournament is going to begins from 11th March, 2012 in Bangladesh including other giants defending champions and 5 times winner India, 1 time winner Pakistan and 4 times winner Sri Lanka. Each team will play one match with others and the top two teams will play in the Final on 22nd March. 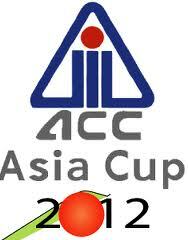 Find the complete schedule of 2012 Asia Cup in Bangladesh.